Every year the U.S. Postal Service raises its rates to increase revenue. The ever-higher prices have made direct mail as a marketing tool prohibitive for many companies. Add up the costs to produce the direct mailer, purchase a mailing list and pay for postage, and it’s no wonder that most businesses opt for email to send out their message. But did you know direct mail has a response rate of 10 to 30 times that of email? So you might not want to write it off so quickly. The good news is, now there’s an alternative, one that gives you the benefits of direct mail but doesn’t cost as much. Every Door Direct Mail is an affordable way to target your local neighborhoods. Operated by the U.S. Postal Service, it makes direct mail easy and cost effective. And it’s an excellent choice for small and local businesses, ranging from restaurants and retail stores to service providers like realtors and dentists. 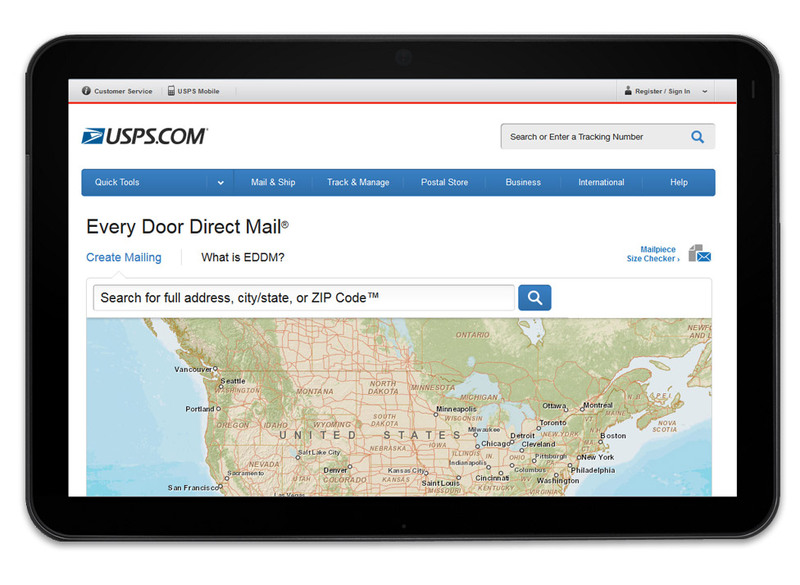 Instead of addressing your direct mailer to specific names and addresses, the United States Postal Service’s EDDM program allows you to have mailpieces delivered to every mailbox in a specific area. You don’t need a mailing list. Using the post office’s online mapping tool, you select the zip codes and neighborhoods you want to target. You can also use demographic data including age range and average household income and size to choose among routes. Mail carriers distribute the direct mailer to area businesses and residences along with their regular deliveries. With EDDM, you can reach potential customers for as low as 18.3¢ per mailpiece. The actual postage savings with EDDM marketing is about 3 cents over postcard first class rate, and about 7 cents over standard letter rate, depending on the size of your mailer. If you’re mailing a large quantity or doing multiple mailings, the savings adds up quickly. Most EDDMs are in the form of oversized postcards. They stand out from regular mail and grab the recipient’s attention. They’re also hard to ignore because they’re not in an envelope. 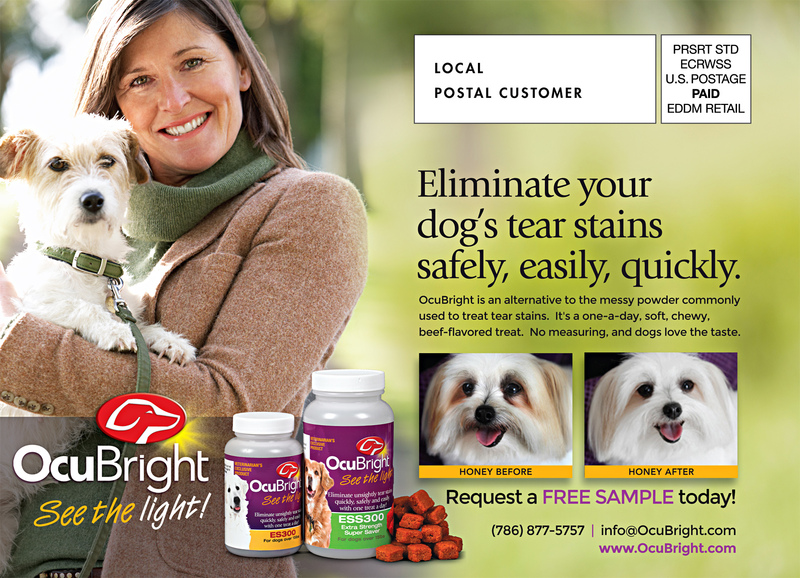 Sample EDDM oversized postcard I wrote for a company selling a product that eliminates tear stains on light-colored dogs. 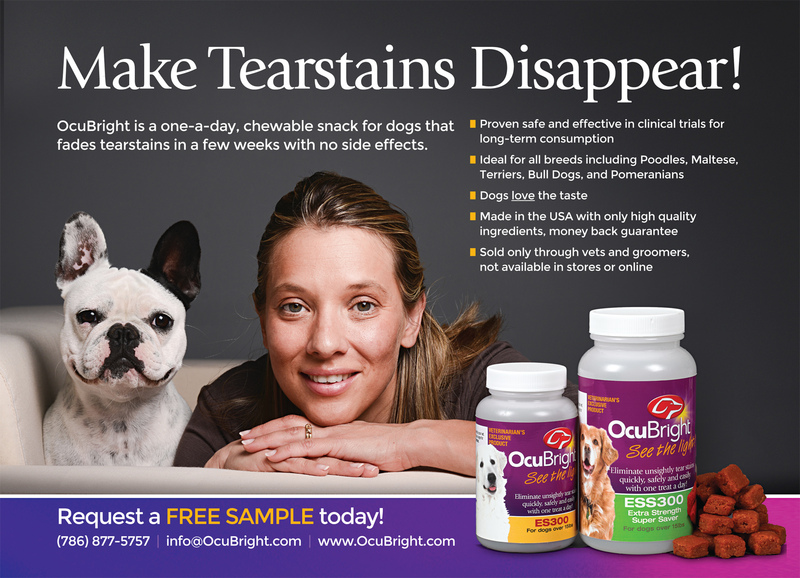 Side #2 of EDDM postcard for canine tear stain product. For communicating your message, postcards pack a powerful punch. They achieve a high rate of readership and generate a high rate of response. With space on both sides, you’re able to include copy and photos or even coupons and a map to your location. Direct mail has always been a good choice for local businesses. Now the discounted mailing rates of Every Door Direct Mail makes it an even better option. Use it to announce store openings, sales, new products or upcoming events. Retailers can use it to announce sales or new products. As you can see, EDDM has a place in the marketing plans of all types of businesses. An EDDM mailing is a great way to market your business without your competitors knowing. 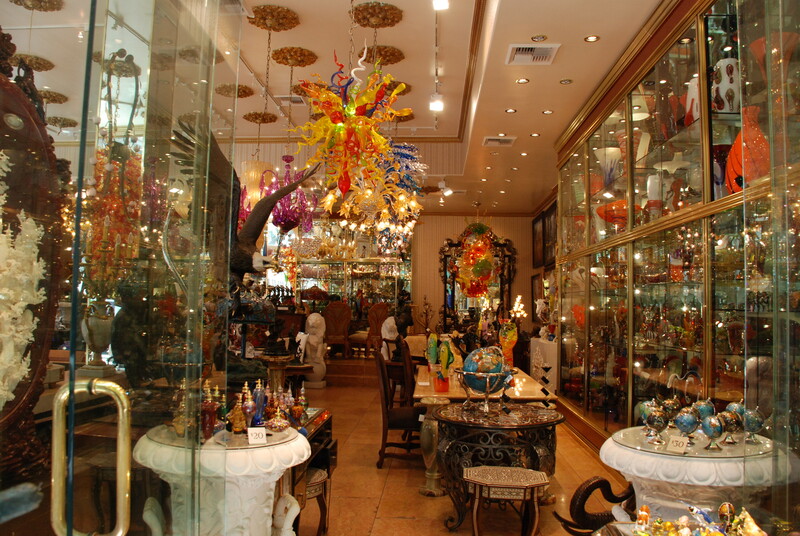 Only prospective customers are likely to see it. That keeps your marketing strategies and your message from being exposed to your competition. Discretion can be an advantage if you’re testing new products or services. A little secrecy can give you an edge. For your mailer to be effective, you’ll want to give careful thought to creating its content. Art attracts but copy sells. 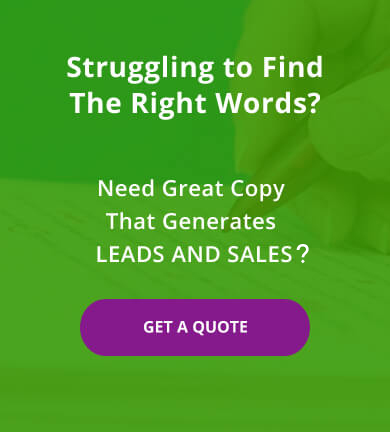 A professional EDDM copywriter can work with you on how best to present your message. Whether you use EDDM to announce a sale, describe a service or even provide a menu, the copy must target your audience. Keep in mind that postcard marketing is a response generator, not a brand builder. 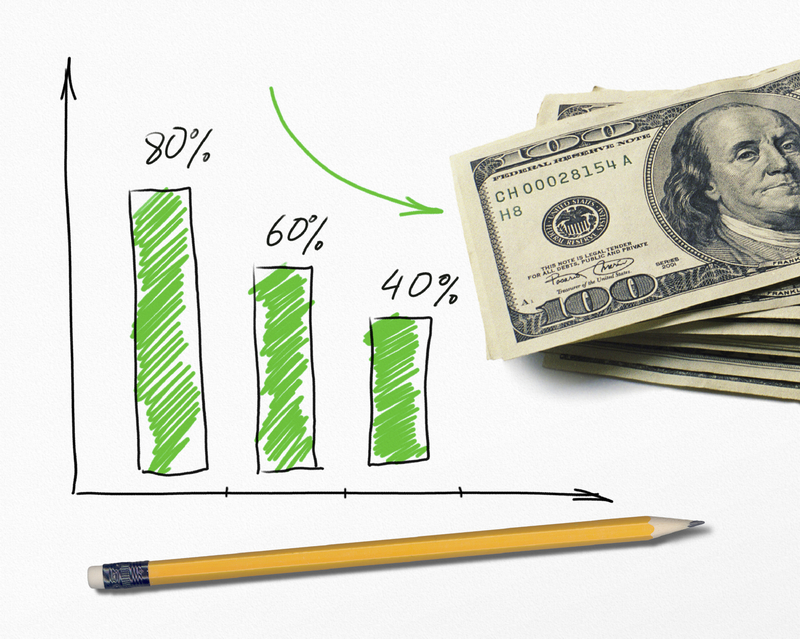 If you appeal to your readers with the right offer, you’re more likely to get good results. Your wording must inform, enlighten, persuade and finally motivate the reader to take action. 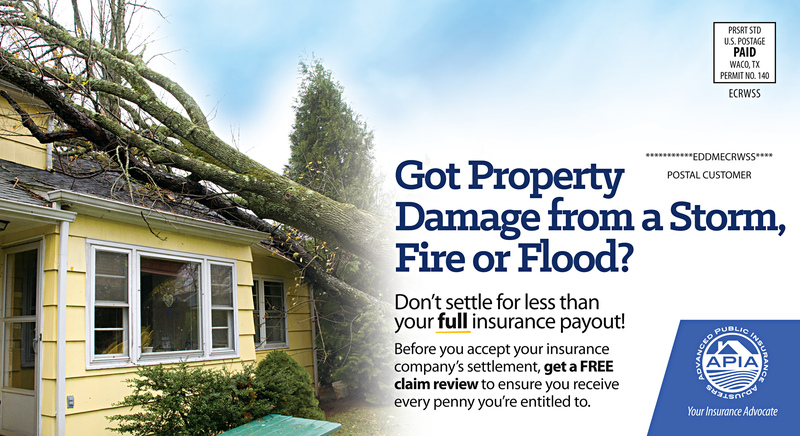 Sample EDDM postcard I wrote for a public insurance adjuster company. 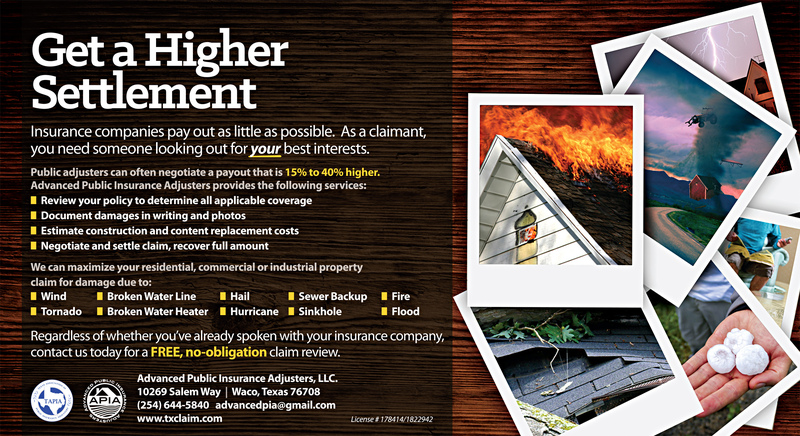 Side #2 of public insurance adjuster postcard. Even though you can put information on both sides of the postcard, space is limited, so your copywriter will work hard to make every word count. For most products or services, the recipient of your mailer isn’t going to buy immediately after receiving a postcard from an unknown sender. But hearing about you is certainly the first step toward a sale. Your best bet is to craft your postcard as an attention grabber. Once you have the recipient’s attention, you can direct her attention to your website, physical location or phone number where you can describe the benefits of your product or service in more detail and convert the prospect into a customer. Use a headline that states a benefit to attract reader attention. Create a message that solves a problem, presents a solution, and offers value. Apply subheads to break up large blogs of text. Keep it simple. No complicated concepts or explanations. Use numbers and other eye-catching specifics. Avoid generalities. Condense facts into concise bullets. Use white space to avoid looking cluttered. Select photos and graphics to make your mailer visually attractive. If you want to ensure that you EDDM mailer looks and sounds its best, then hire experienced professionals to do the work. A professional copywriter working with a graphic designer familiar with EDDM requirements can create an eye-catching postcard with a compelling message that gets the results you seek. Size – The mail piece must be taller than 6.125″ or longer than 11.5″ and smaller than 12″x15″. The most common sizes are either 6.25 x 8.5”; 4” x 12”, or 6” x 12”. Thickness – Choose a paper thickness of 12 or 14pt card stock so the mailer doesn’t feel flimsy. You also want it to be somewhat durable so it doesn’t get creased or crumpled in transit. Consider UV lamination on one side for a glossy, more professional look. Check with your EDDM printer that their paper stock is EDDM compliant. Color – Print in full color. Print – Print on both sides. One side should have the biggest, boldest photos and colors. The other side should carry your offer, contact information and other details. Maximum – The postal service limits EDDM mailings to 5,000 pieces maximum per mailer, per day. Delivery – The delivery time is 7-14 business days. Indicia – This special marking used as a substitute for stamps and provided by the post office must be printed on the mailer. While the EDDM specifications might sound restrictive, almost any printer is capable of producing a postcard that meets the postal service’s requirements. You can choose a printer in your local area or search for one online. Postcard printing is relatively inexpensive since it uses minimal paper and doesn’t involve functions like folding, binding, stapling, stuffing or sealing. Be sure to check costs for different printing quantities, as you might find substantial price breaks for higher quantities that lower your cost per piece and make a bigger print run worthwhile. Keep in mind that unlike regular mail, your EDDM postcard can take one to two weeks to be delivered to its destination. Use that time to prepare for the response. Check inventory levels and be sure you have plenty of product on hand ready to be sold. Perhaps you also need to staff up to cover phones or have trained personnel onsite ready to receive customers. You don’t want any prospects to fall through the cracks. After all, you paid for those leads! Before you spend a lot on an EDDM campaign, you might want to run a small test. Choose a small target area for your mailing. Did you get good results? If you have an opportunity to talk with customers who respond to your mailing, see if you can determine what specific information persuaded them to take action. What are their hot buttons? Was it a discount or freebie that caught their eye? Is there anything that concerned or confused them? Once you’re satisfied your EDDM mailer will be effective, then do a mailing to a broader area with more households. You might even consider establishing a schedule to do mailings regularly. Data helps you to make better decisions, so track the results of your EDDM mailing. What you learn today will help you to optimize your future EDDM mailings. One of the easiest ways to track postcard marketing is to include a coupon or ask the buyer to bring the whole postcard into your business to redeem a premium. Your customer will appreciate the perk and you’ll be better able to quantify your EDDM mailing’s success. Ultimately, you’ll want to calculate that for every X number of mailers you sent out, you received X dollars return on investment. Once you know your stats, you’ll be able to determine if EDDM is a cost-effective promotional tool for your business and whether you should include it in your future marketing mix. Ready to use an EDDM postcard mailing to build your business? Susan Greene and her team can produce a custom EDDM mailer that gets you results. Contact Susan now!